Last week, the addition of multiplayer to Uncharted 2: Among Thieves was still a surprise to much of the video game press attending Sony's PlayStation Gamers' Day. Naughty Dog's reveal was almost perfect. After inviting us downstairs to the mezzanine of the Andaz Hotel, Naughty Dog president Evan Wells told the crowd that they'd prepared a new trailer for Uncharted 2—all the introduction really needed at that point. The trailer began with a third-person view of Uncharted's Nathan Drake, sprinting toward a dilapidated building, assault rifle in hand. Finding footholds and jutting bricks, Drake showed off his refined terrain traversal, climbing the half-decimated wall, then pulling himself up to the building's second floor. In the distance, nine players with their PlayStation Network IDs floating above their heads. Cut to a montage of five versus five deathmatch and everyone in attendance gets a little more excited about what they're about to go hands on with. Last week, it was a secret well-kept. And you could see it in the grins on the faces of the Naughty Dog team. Drinks and attempts at appearing polite were dropped as quickly as Naughty Dog said it was time to play. So we speed-walked as nonchalantly as possible toward an open machine and we played. First up—Deathmatch. Uncharted 2: Among Thieves' take on deathmatch, which is capped at five players per side, doesn't appear to break new ground in team-based multiplayer. It's rather standard stuff, with weapons scattered about each arena, maps customized from single-player levels to fit a multiplayer play style, and a goal to shoot them before they shoot you. You'll play as one of five Heroes, including Drake, Chloe, and Sully, or one of the black-suited mercenaries, the Villains. But the deathmatch rule set, when applied to Uncharted's mechanics, works beautifully. Gunplay worked well enough in the original Uncharted: Drake's Fortune, and it works better than that here. Players need to take advantage of cover, hiding behind brick walls, firing blindly when it's needed. You'll have a tactical advantage hiding out of sight—recovering health while you're doing so—or traversing the environment to get to higher ground. Platforming works to your advantage. But that top-down perspective on the deathmatch arena has a risk tied to it—you've got to climb, exposing yourself to enemy fire. The arsenal is pretty standard stuff too. There are assault rifles, pistols, sniper rifles and a very deadly, easy to dominate with chain gun. Rocket launchers and grenades will add some explosive fun to the mix, as will the game's melee kills. If you're a little too close for comfort, two butts from your AK will do the trick. But if you manage to grab your opponent from behind, one quick, neck-snapping melee attack will do the job faster. Deathmatch (and other multiplayer modes) add a bit more depth with a skills system that will quickly remind one of Call of Duty 4's "perks." 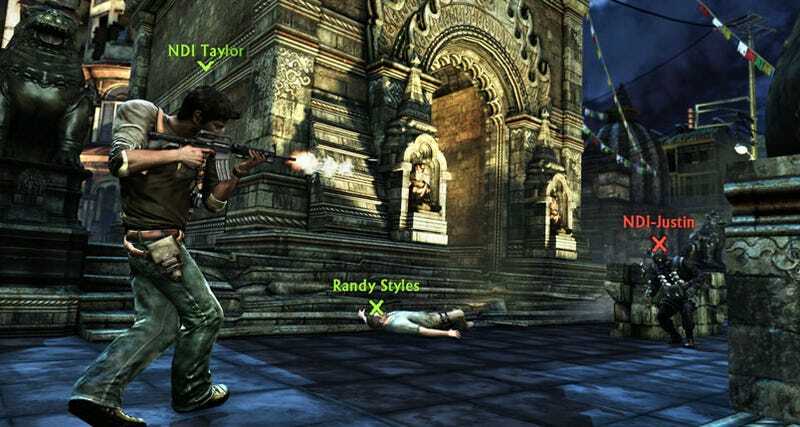 In Uncharted 2, unlockable abilities will let players have better accuracy with rifles while running, for example, or perform better while blind firing. Two skill slots are available, but no single bonus attribute that we saw looked to hint at unbalance. There's also a currency system that Naughty Dog wasn't quite yet ready to speak on, but we do know that it permeates both single and multiplayer mode, and smells a heck of a lot like an experience/skill-buying system. Yes, Uncharted 2's deathmatch appears to be very meat and potatoes, based on the two arenas we played through in multiple games, but meat and potatoes are popular for a reason. Uncharted 2's Plunder mode is a nicely-named Capture The Flag mode, one that takes its treasure hunting theme into consideration. Plunder carries over much of what makes the game's deathmatch mode enjoyable, adding extra teamwork into the mix. The goal is straightforward: find the hidden treasure, typically a large gold idol, then carry it back to base. Yep, that's Capture The Flag, alright. The rub in Plunder is that while one's holding the treasure, your character will walk slower—gold is heavy, by the way—and be unable to shoot anything other than a pistol. But if things get hairy, you can throw the treasure. In fact, you can pass it to another player, speeding up the process. In fact, Naughty Dog reps say, in some playtests they've set up "fire bucket brigade" lines, grabbing the gold, then heaving it from team member to team member, avoiding that whole walking thing. Plunder, as we played it, was a best of three affair. I'd expect other game options will be open to you when the game ships. Uncharted 2 does coop one-better, belying its "2" with three-person cooperative online play. Coop doesn't necessarily follow the single-player storyline, offering an alternative way to play the game, something that feels even more action intensive than what solo play has to offer. Enemies will come at your three person team—which consisted of Drake, Chloe and Sully in the level we played—from all sides. Progression may be forward (and upward), but heavily armed mercs will spawn from any available opening, flanking you, shooting you from behind. They just don't stop coming. That makes some of your goals extremely challenging. You'll need to cooperatively traverse and alter the environment, giving other players a boost to street signs they can't reach without your help, lending a hand when all three need to lift a heavy bureau. Teammates will be able to revive their downed partners as well as rescue them from the clutches of bad guys, so the three-way buddy system looks to be fully explored. While cooperative platforming and terrain traversal may not sound like the online thrill you've been looking for, the intensity of the gunplay should more than make up for it. That's particularly true when mid-level bosses show up, guys decked out in full body armor, armed with those massive chain guns we mentioned earlier. While Uncharted 2 looks like it won't be slouching in the "shoot guys in the face (and often)" department, the run and gun action in coop play looks like it will be a serious challenge, one that will require everyone on your team is sporting a Bluetooth headset. I say that because during those co-op missions, I died. A lot. The addition of multiplayer and coop to the Uncharted series may have given fans of the original game's single-player mode pause (or cause to whine on the video game forum of their choice), we have to mention that this addition is already a welcome one. At least from a multiplayer perspective, Naughty Dog looks to have nailed it, based on our hands-on time with the game. Comparisons to Uncharted 2: Among Thieves online components will likely draw comparisons to another multiplayer hit: Epic Games Gears of War 2. And that's not such a bad thing, considering how popular that game continues to be online, many months after its release. The feel and visual aesthetic are clearly Uncharted, however, and we think that Naughty Dog might have a multiplayer hit on its hands.